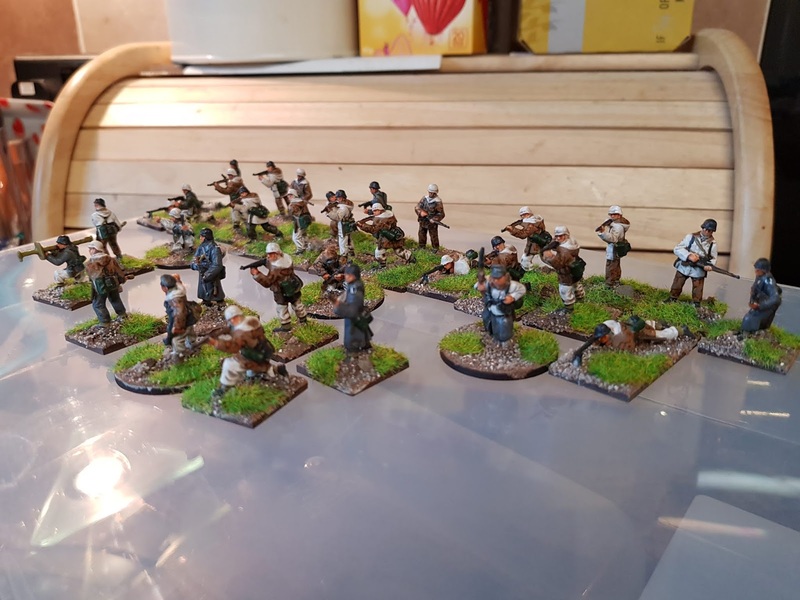 Another effort at German WW2 infantry painted after I had read the Farnsworth Guide. 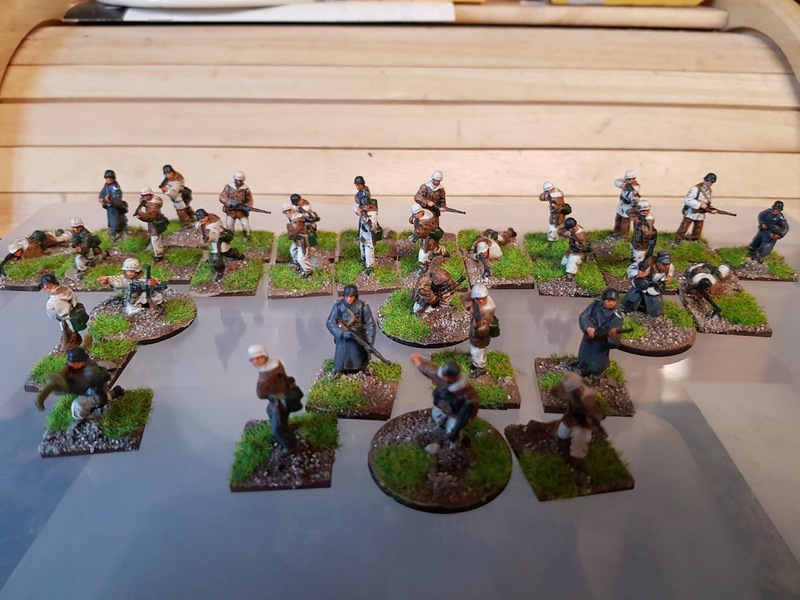 These are mostly Italeri WW2 German Winter Infantry, with a couple of extra bogs from the Italeri WW2 Elite German Infantry and a greatcoat-wearing Caesar figure. 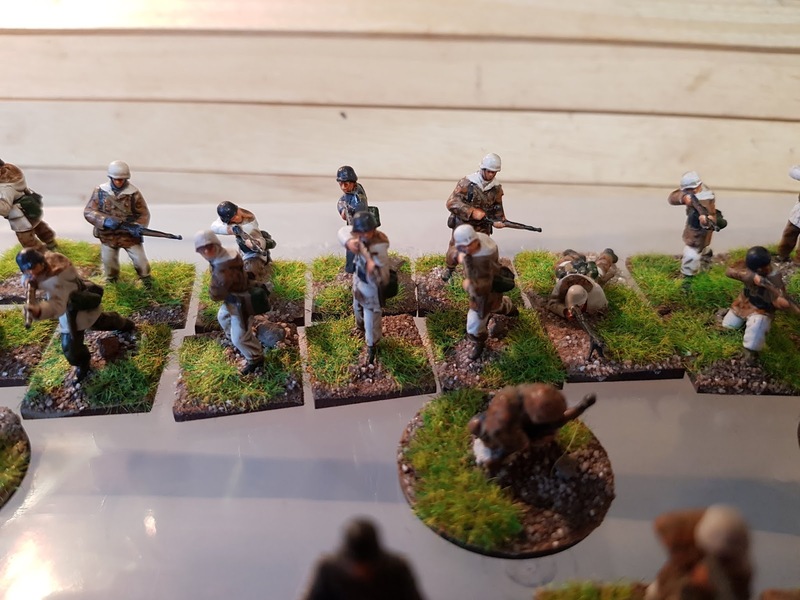 The NCOs on round bases are the EWM (former Sgt Major Miniatures) NCOs posted earlier. 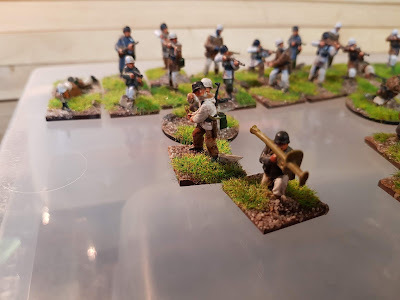 Lighting was shocking poor and uneven in these photos, but the best I could do at the time. 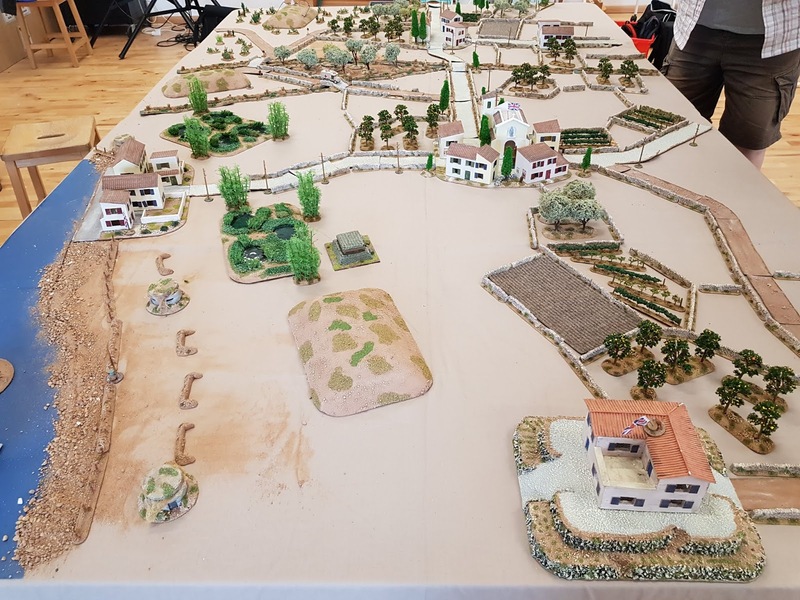 The entire platoon, three 8 man sections, each an MG34 team of 3 men and a rifle team of 5 men, together with a 6 man command section and a 2 man Panzershreck team. 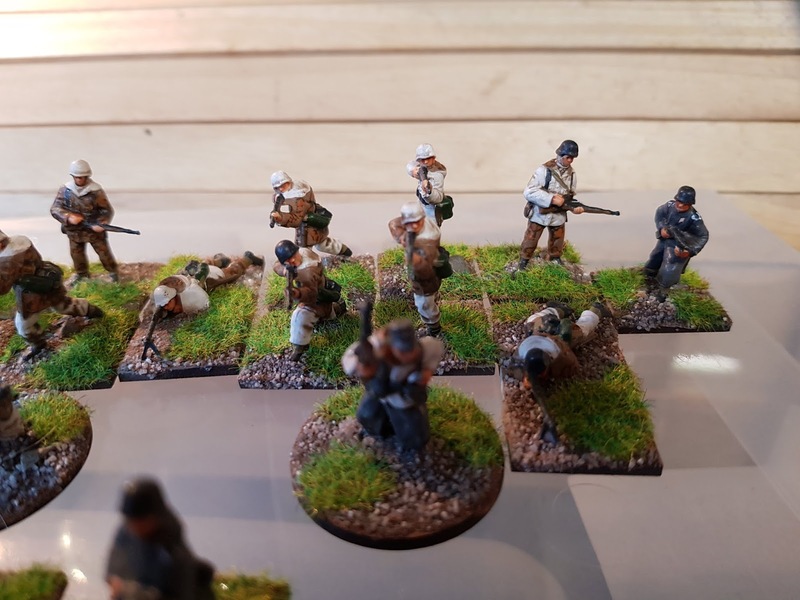 These are suitable for Battlegroup or Chain of Command. 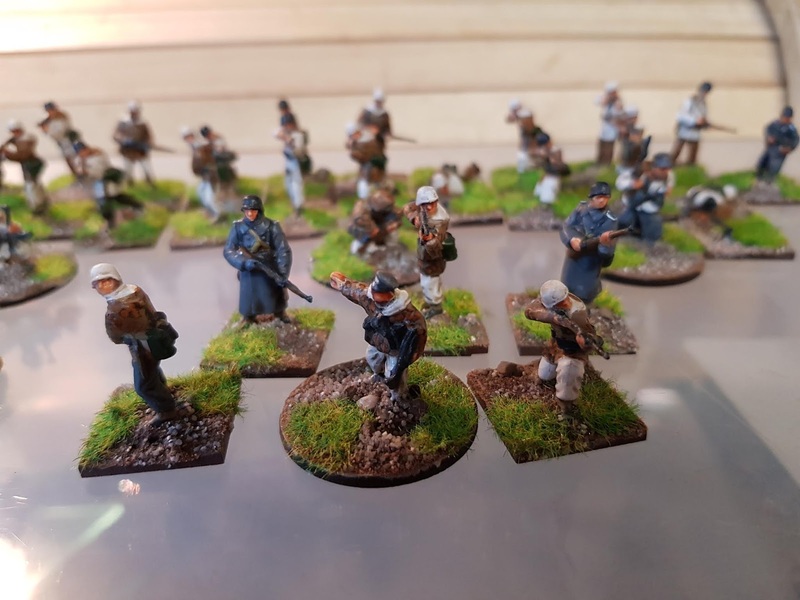 The greatcoat-wearing figures are done in a standard London Grey colour, while most of the remainder are wearing hooded parkas and over trousers, which I've done in winter white, or an autumn Oak Leaf pattern. A couple of the figures are shown in grey trousers or shirts (mainly those from the Elite infantry set) for a little bit of variety. 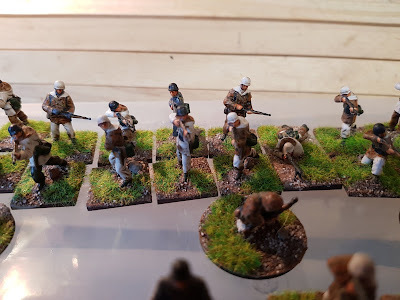 I think it gives them a bit of a rag-tag veteran look, although they could equally work as a Volksgrenadier platoon for the Bulge, Berlin or late Eastern Front. 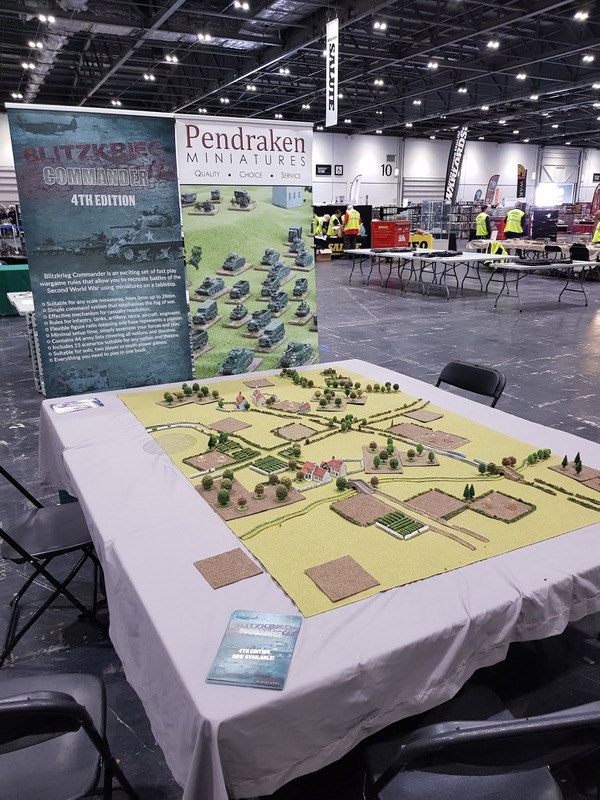 They do suffer from a shortage of Panzerfaust armed troops, so I'd have to use markers to indicate any allocation of Panzerfausts. Command section, slightly better lit. The whole platoon, again slightly better lit. 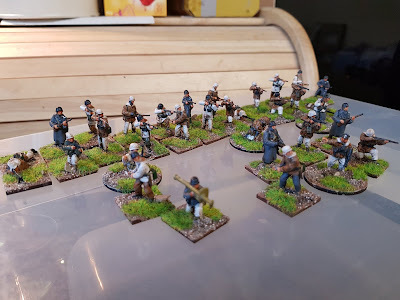 Quite nice figures, lots of detail and not a lot of excess plastic and no flash, which made them really simple to paint, especially after a session in the top drawer of the dishwasher. Almost ready are some more Atlantic Wall defences and some additional supports for the winter platoon in the form of a 37mm AA gun and 120mm mortar. 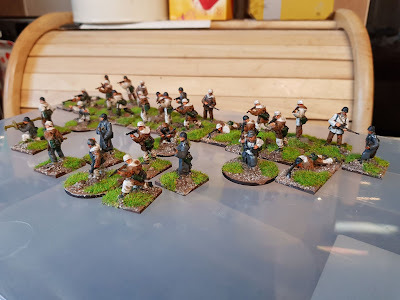 Looking through the spares from the Winter and Elite sets, as well as Caeser sets of greatcoated and Zeltbann infantry and winter infantry, there are probably enough assault rifle armed figures to make up a platoon exclusively armed with the Surmgewehr 44, so I can make up a very Late War platoon suitable for Volksgrenadiers, Heer or SS units in Berlin or 1945 in general. My plans also include a platoon of Volksturm in a mix of uniforms and civilian clothes, plus some Hitlerjugend tank hunter teams. 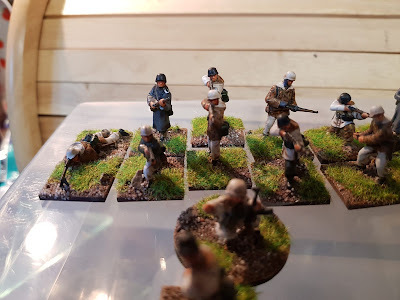 Those will be for another day, as I'm now trying to progress the British vehicles that I picked up at Vapnartak. Then, at last, I've made some progress on test figures for the Britannia British airborne infantry - although I realised I will need more figures to complete the platoon I had planned plus an engineer section and supports. 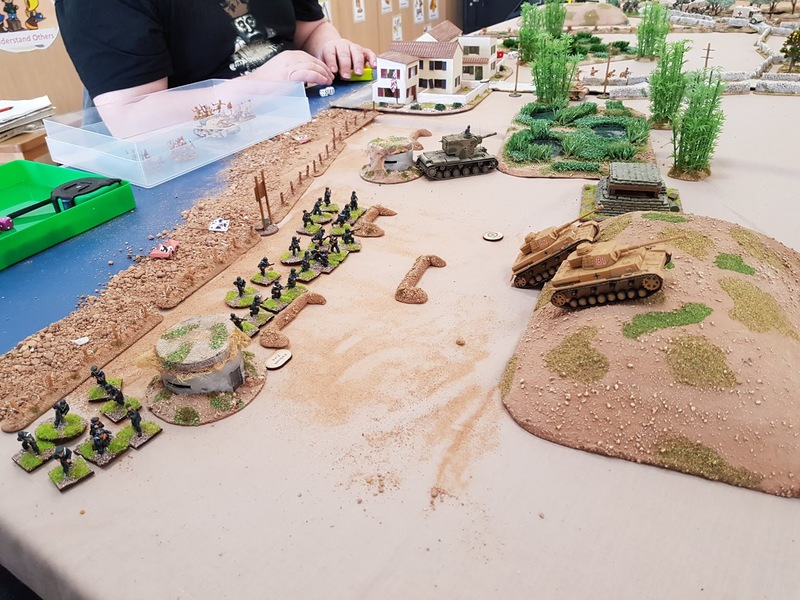 Day 2 action began with a pair of Pz IVs and a beute KV-2 coming across the narrow beach, passing the largely destroyed beach defences and probing inland, supported by a platoon of Kriegsmarine. 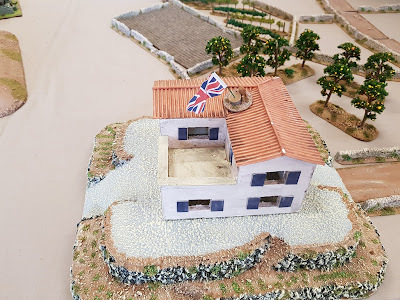 To their left, a pair of Semoventes supported by a platoon of Italian marines occupied the coastal village, including the Novelty Rock Emporium. 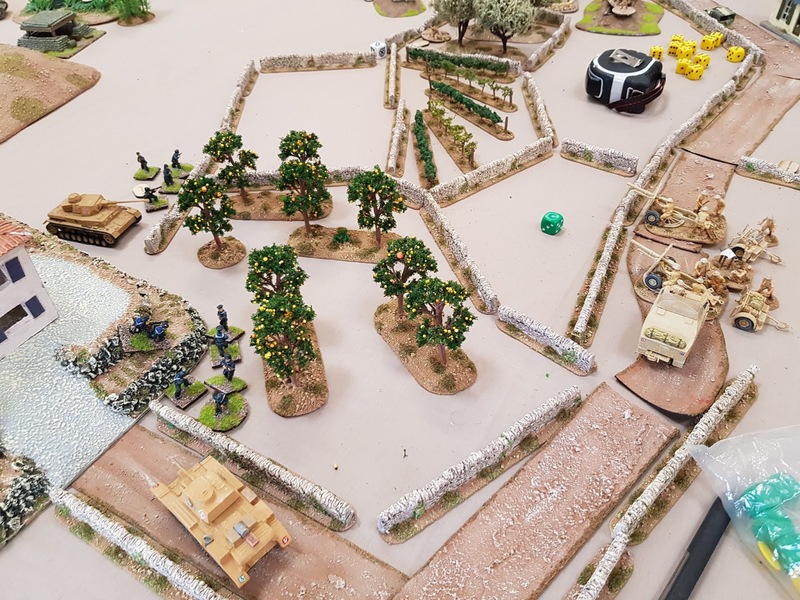 One of the Semoventes starts to probe forwards under the watching gaze of marines with LMGs and an MMG in the coastal town in the foreground. Over on the British far right, two platoons of Gebirgsjager, advancing from the airfields secured yesterday, attempt to join up with the naval landings. 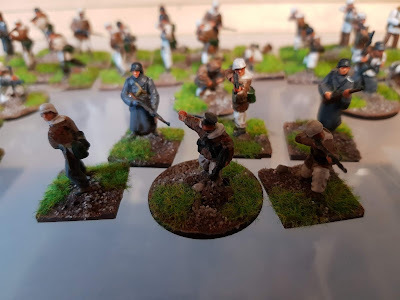 Hurrah for the 25lbrs. The two gun battery bracketed the KV-1, scoring a killing hit, unlikely to penetrate the thick armour on the KV (double 6 being needed), but a useful double 1 resulted in an automatic immobilisation. 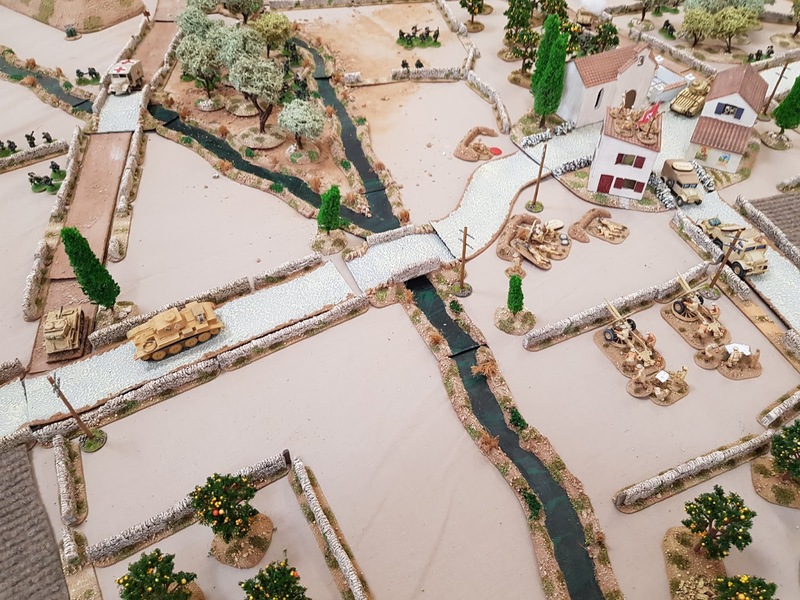 The British armour advancing onto the table included 2 Vickers Mk VI, which were allocated to the front against the Gebirgsjager, supported by a Matilda II. Two more Matilda IIs and three A12s were pitched at the naval landings. 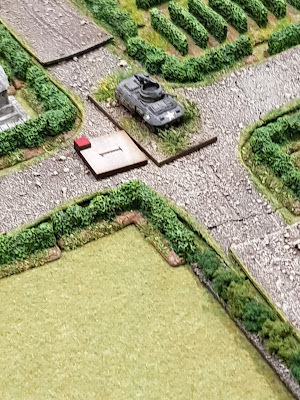 An A12 struck a lucky hit on one of the PzIVs, brewing it up. The Kriegsmarine attempted to swing around the flank to deal with the 25lbr battery, but this was countered by an A12, with a Matilda following up. With the KV-2 immobilised, the Semoventes attempted to break into the town, only to be faced with a pair of Matilda IIs and an A12. 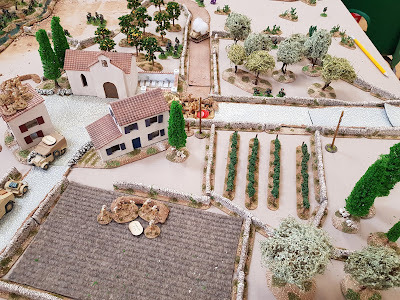 One of the Matildas brewed up a Semovente, so the other was despatched to bolster up the flank against the Gebirgsjager, which was under significantly more pressure. 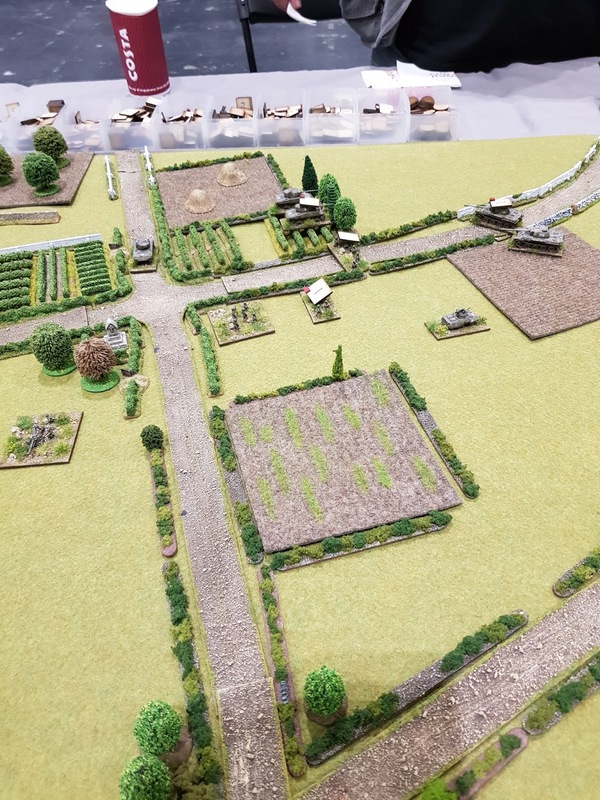 The Gebirgsjager had more or less broken the infantry platoon in the town and managed to KO one of the Vickers, although the MGs of the other Vickers and an A12, with a Matilda II rattling up in support, was making the hardened mountain troops think twice. 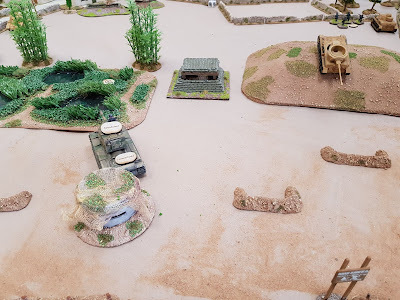 The Vickers burns in the distance. Very little stands in the way of the Gebirgsjager. Gebirgsjager advance through the woods and olive groves around the town on the British right. Gebirgsjager about to link up with the naval landing force. The Italians occupy the coastal town, with a pair of squads thrown forward to support the lone Semvente. 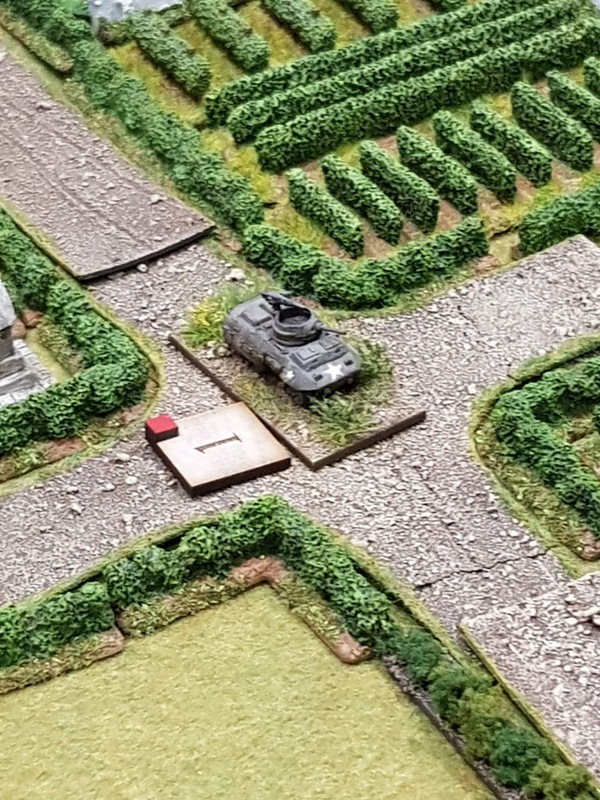 Another lucky hit on the KV-2 caused a morale test, which the German crew failed, abandoning the vehicle - counting as destroyed. 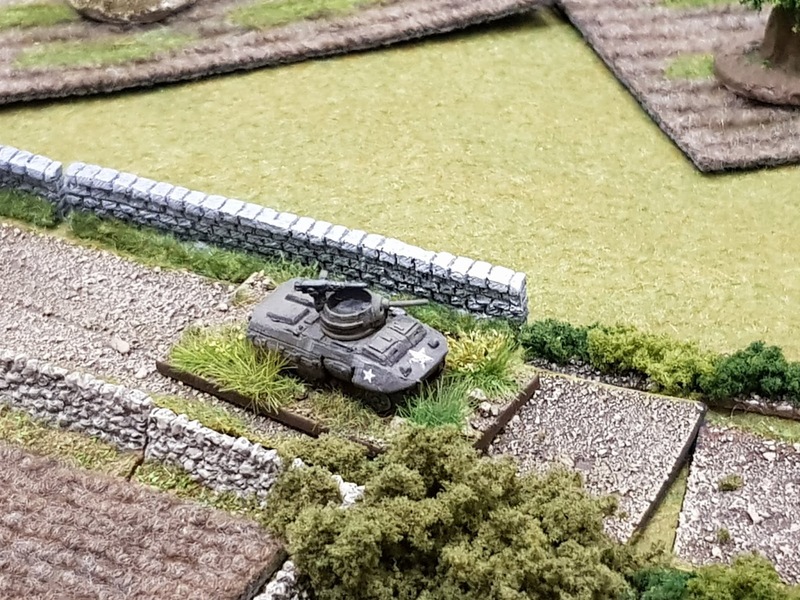 With only one serviceable Pz IV and a Semovente left on the British left, the axis forces lost heart and the advance stalled. Sadly for the British, on the right, the Gebirgsjager had effectively dealt with the British platoon, although they were struggling against the steadily increasing numbers of British tanks being fed into the area. 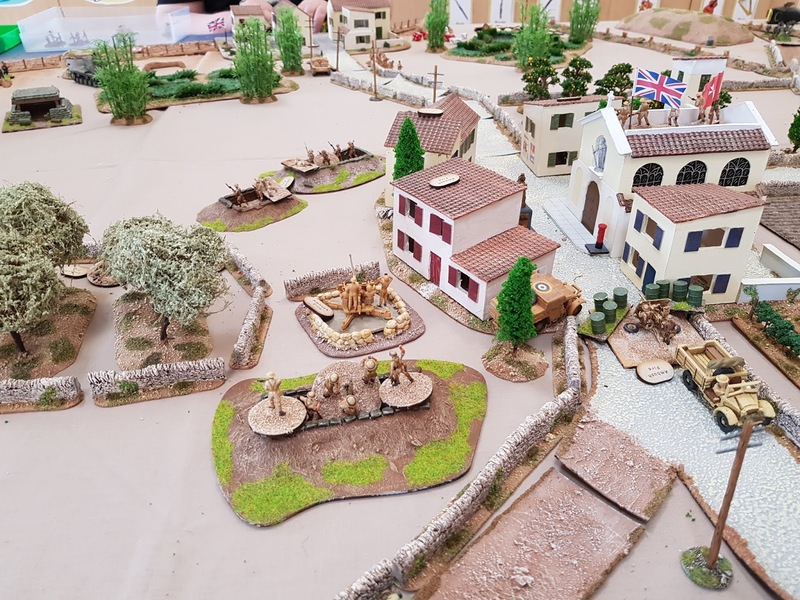 Overall, both sides seemed to have dealt with one flank, but were struggling to make any headway on the other, so each claimed a partial victory, but conceded a partial defeat too. Overall, we were happy to agree a draw. All would depend on who could reinforce first! 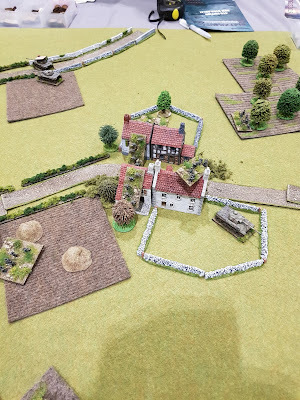 A great weekend's wargaming in brilliant company, lots of good Yorkshire bitter and some excellent pies, not to mention the liver and onions! Back to the games from Crisis Point, after our excursion to Salute. 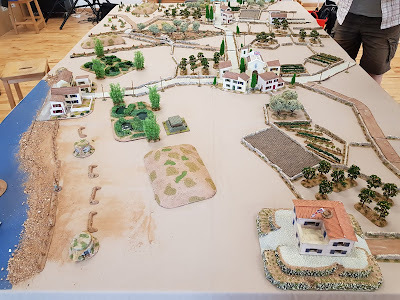 This was the table as we modified it for the second day's gaming, which would see Axis forces pushing inland after a landing in a sheltered bay on the west coast, attempting to meet up with units of Gebirgsjager airlanded at the airfield secured in game 1, and then pushing on to break through to Valetta. 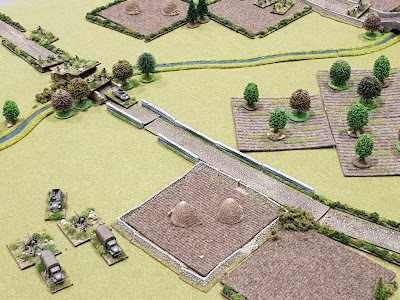 The other end of the table with the hills on the right representing the area the Gebirgsjager would advance from. The British stop line runs along the main road running up the mid-part of the table, with defences centred on the villages in the foreground and distance. 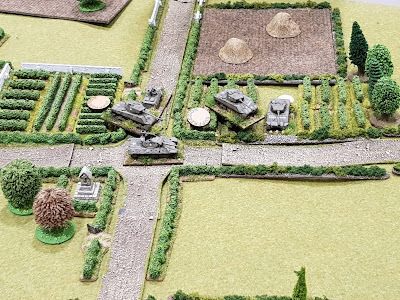 The terrain the Gebirgsjager would be able to cross with relative ease. 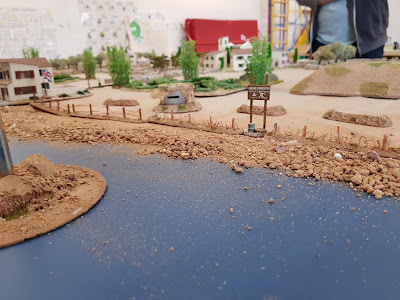 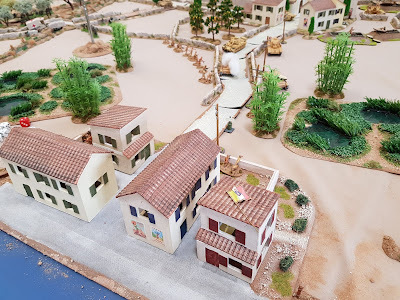 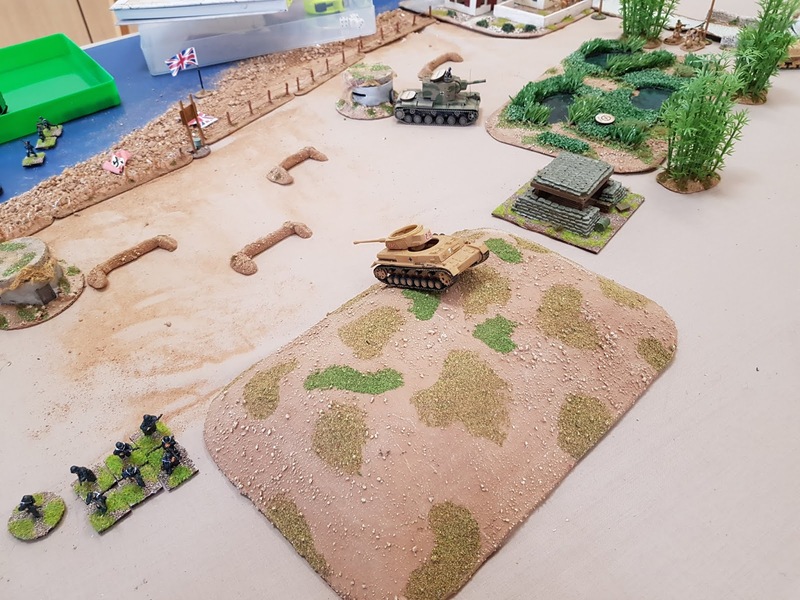 The beach - it would be assumed the beach had been secured by the first wave, so the game would begin with Axis forces exploiting after overcoming the beach defences. The village my British platoon would attempt to defend. 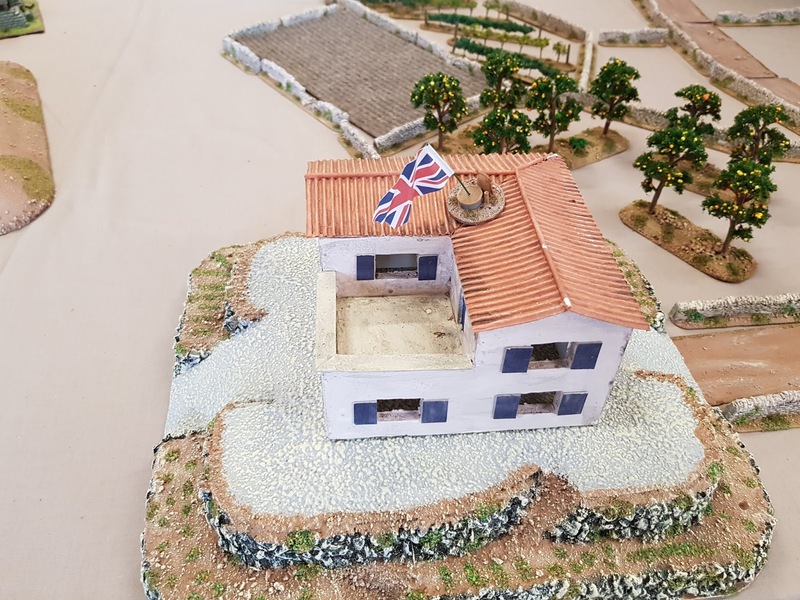 An unoccupied villa with a fine sea view. 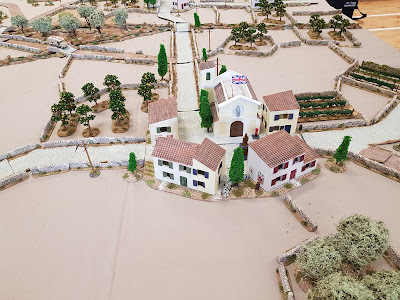 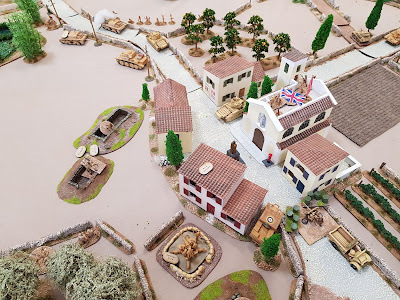 The other village defended by Mike's British infantry. The roads arrived to finish off the table early on Saturday morning, so we set them up and were ready for the off. 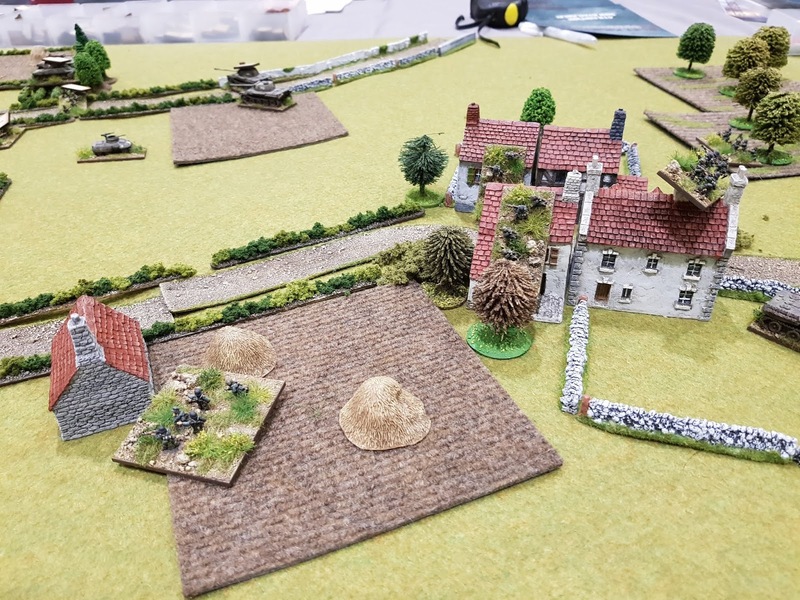 First official move with the new rules, an M8 Greyhound from Andy T's battlegroup races forward to scout out where the German stop line is. 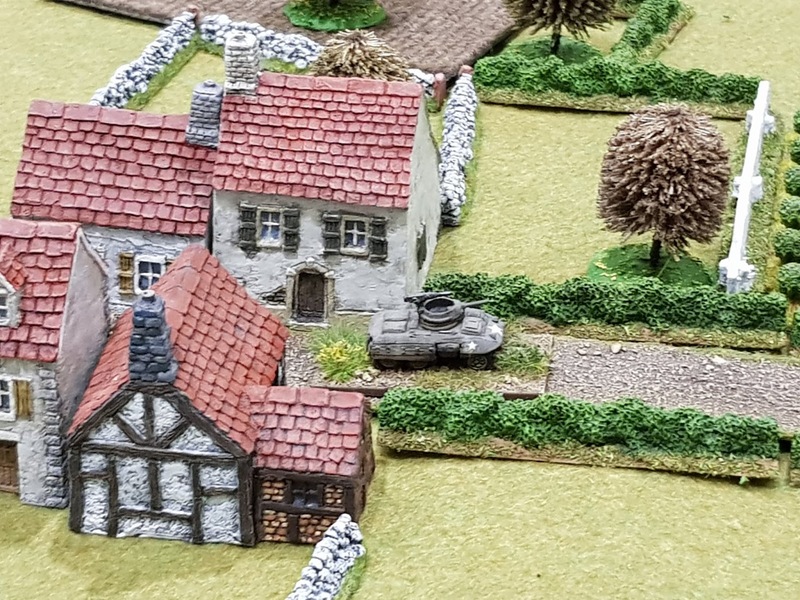 Second activation saw Mark F's Greyhound do a similar recce move. First shooting saw me suppress Andy T's Greyhound with a mortar team - nice use of a special rule saw the "exposed" crew of the Greyhound especially vulnerable to the plunging fire from the mortars, which gained an extra shot and hit as normal in the open against the vulnerable vehicle. First blunder of the game saw Andy T's infantry retreat a half move. BKC emphasises combined arms techniques, so when Marks Shermans, supported by an M10 advanced too far, ambush fire from a PAK 38 and a pair of Panthers saw the lead Shermans suppressed and falling back in the following German activation. Successful command roles then meant the Panthers could concentrate on the M10, which brewed up. Another of the specials is "unreliable" which applied to the Panthers - they role a d6 each turn and are immobilised on a 1 (red marker) - they then get three turns to roll a 4+ or have to be abandoned (counted as lost). 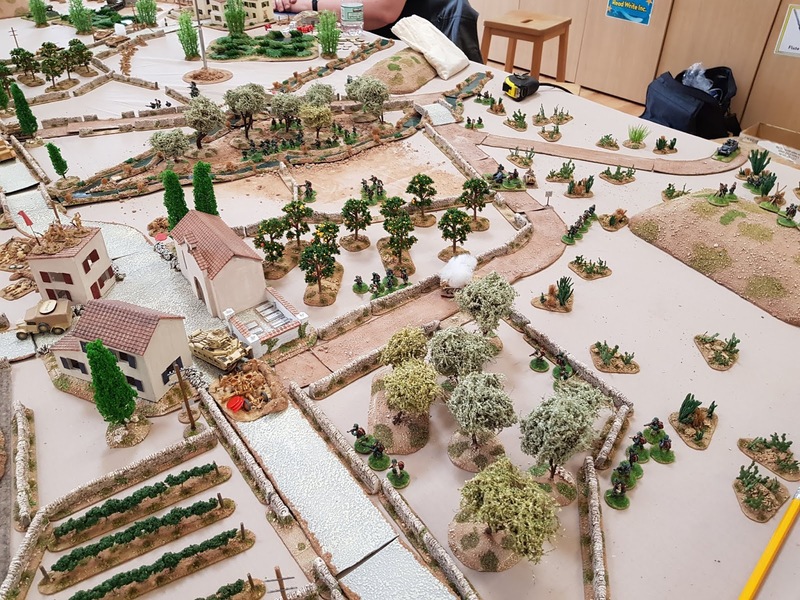 Andy T's AT guns on a driving tour of France. German company level battlegroup holding a wood. 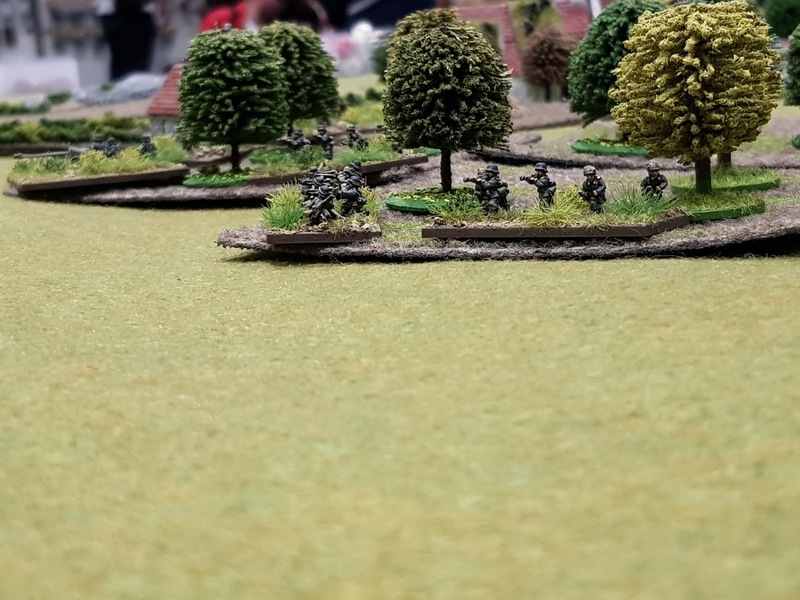 US infantry being whittled down by German fire from the tree line. 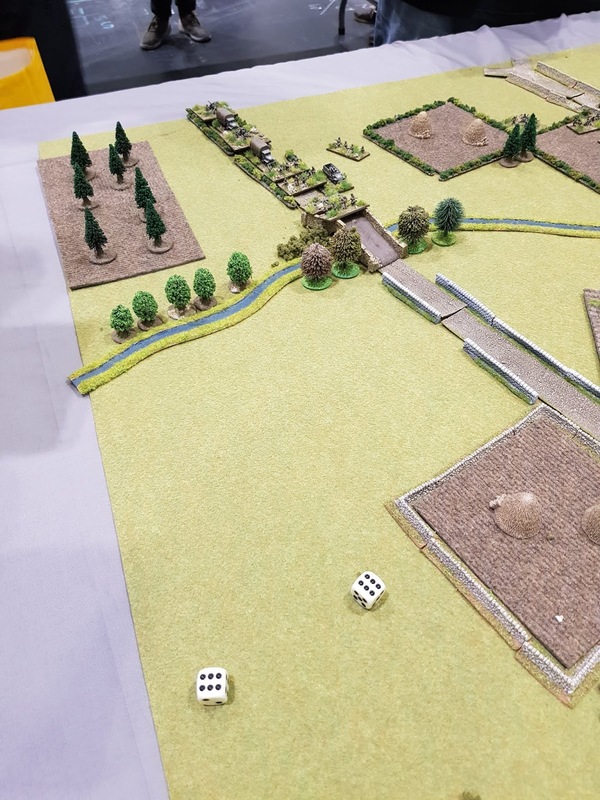 Two stands have already been KO'd. 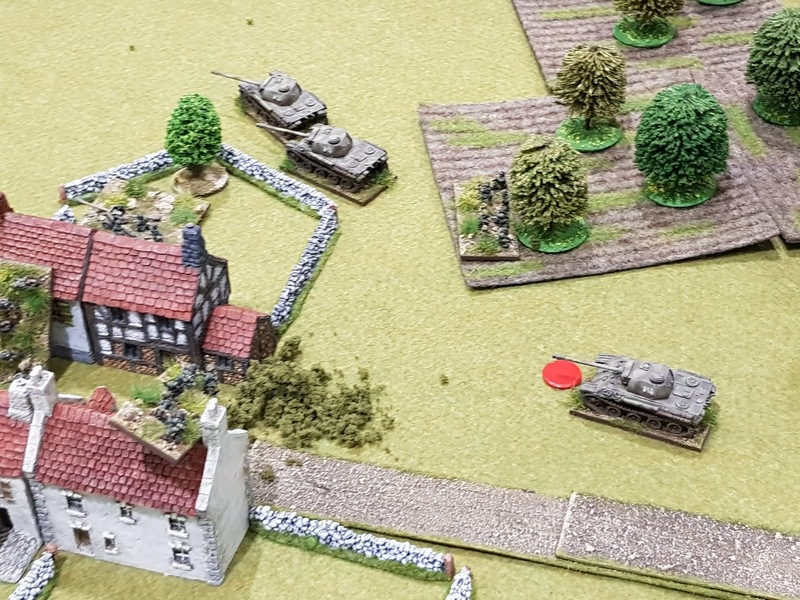 On the other flank, US infantry, a 57mm gun and a Sherman managed to get enough hits on a Panther to KO it, causing much satisfaction amongst the US players. 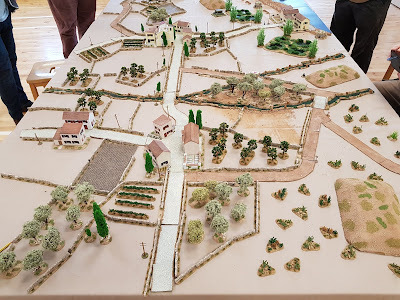 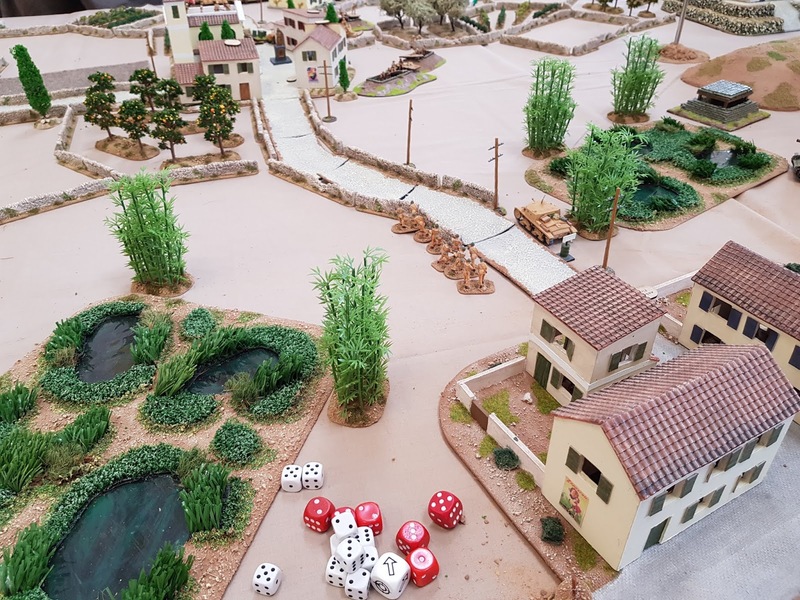 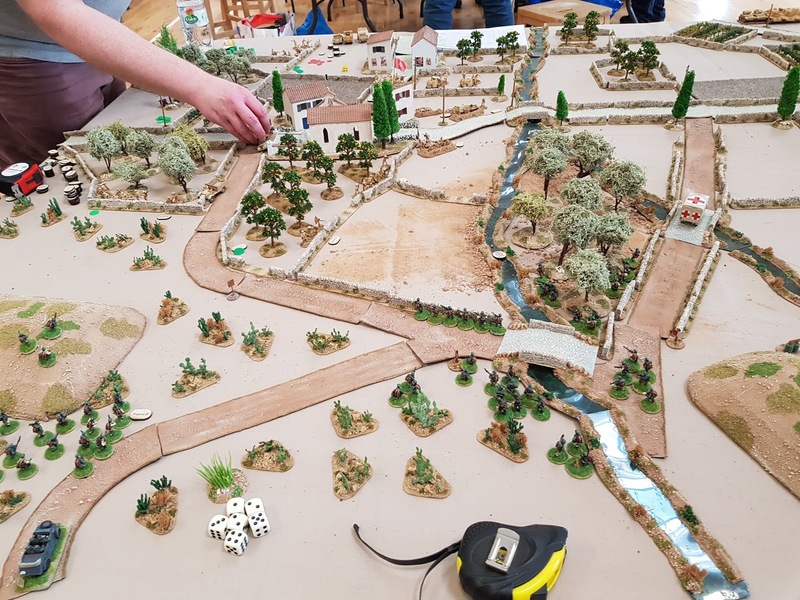 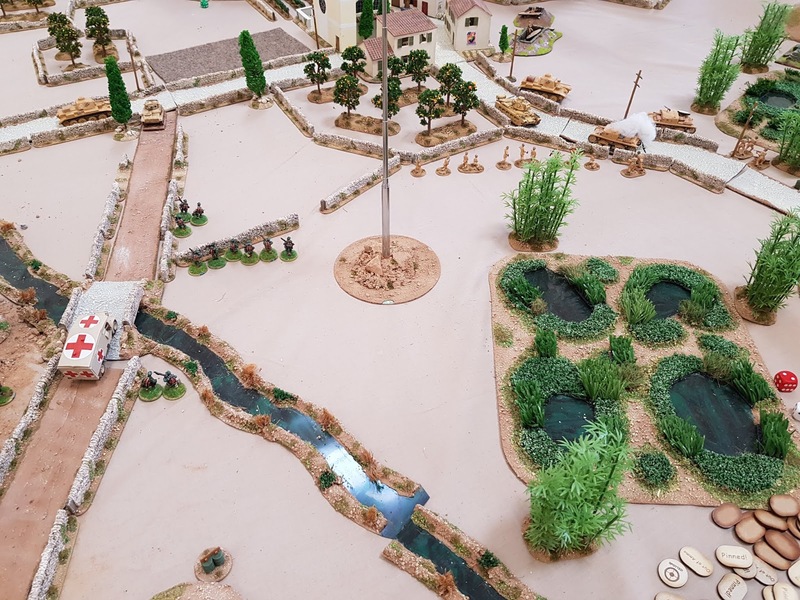 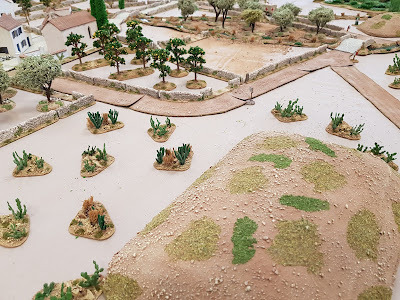 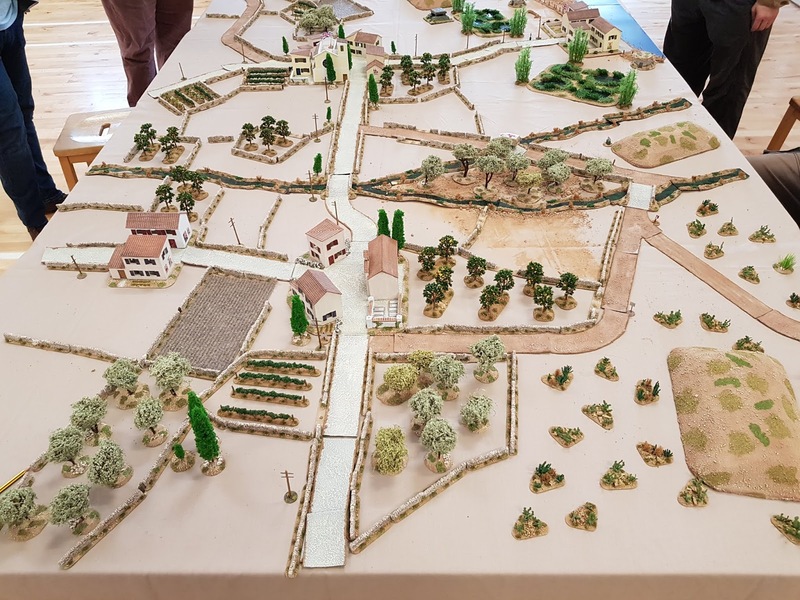 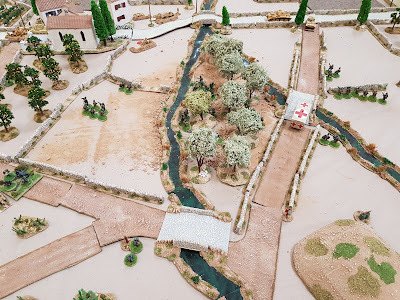 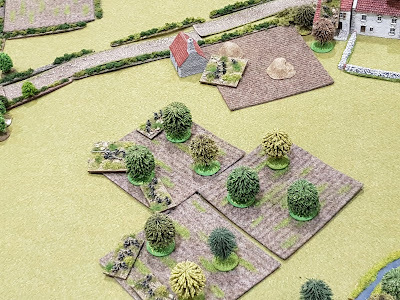 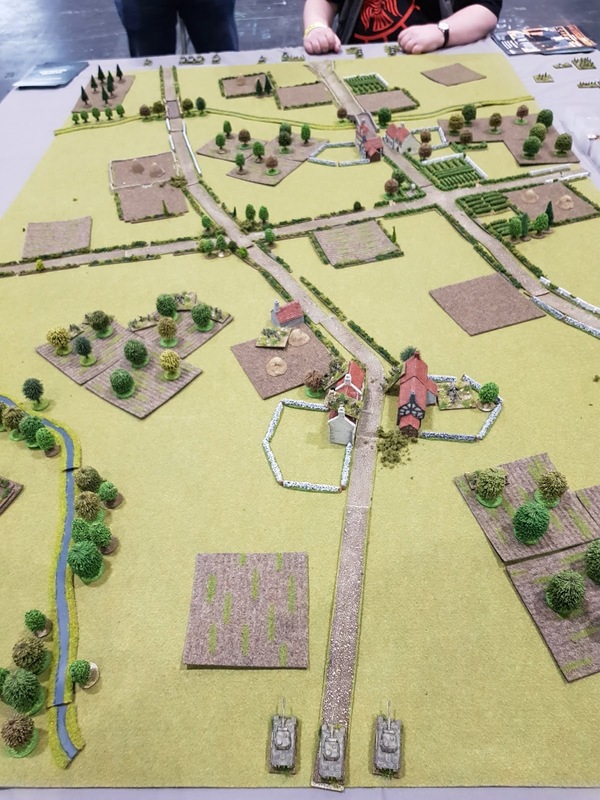 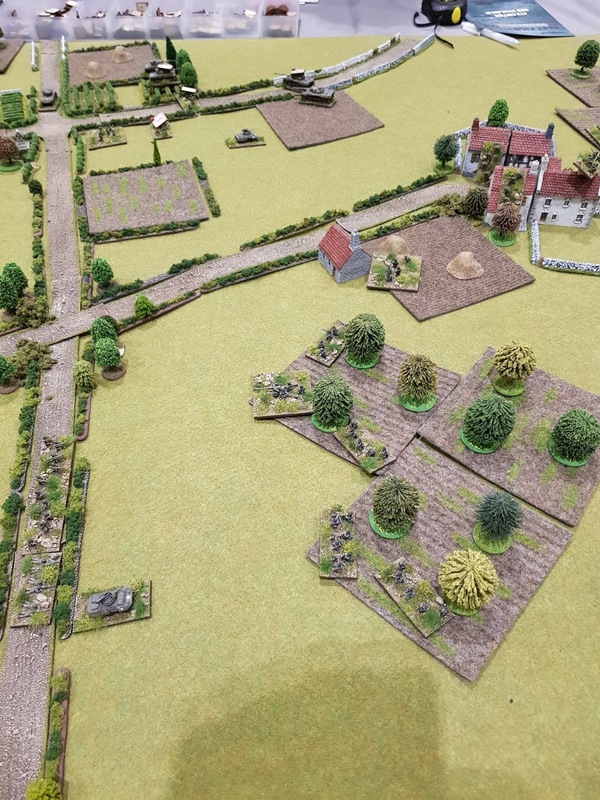 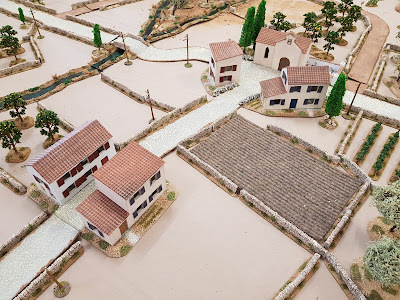 Another German company sized battlegroup deployed in the village astride the road leading off table to the right that was the US objective for the game. 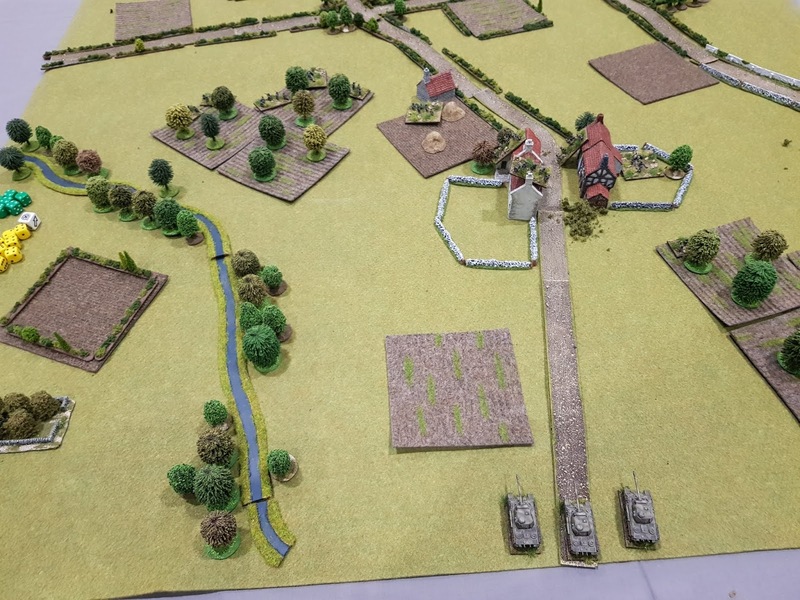 The German CO occupying a farm more or less half way between the two infantry battlegroups. The game ended more or less even by the time the show closed, but the main objectives of the day were to explore the new rules, demo the game to interested visitors and have as much fun as possible - oh and buy some kit in between. All in all a great day out - I enjoyed the show immensely, although definitely not a fan of London prices, but worth putting up with them for a grand day out. 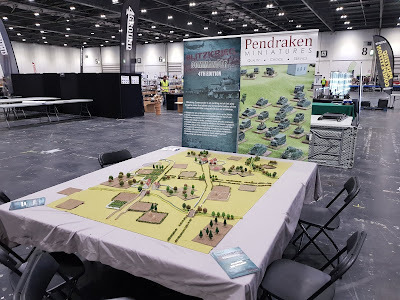 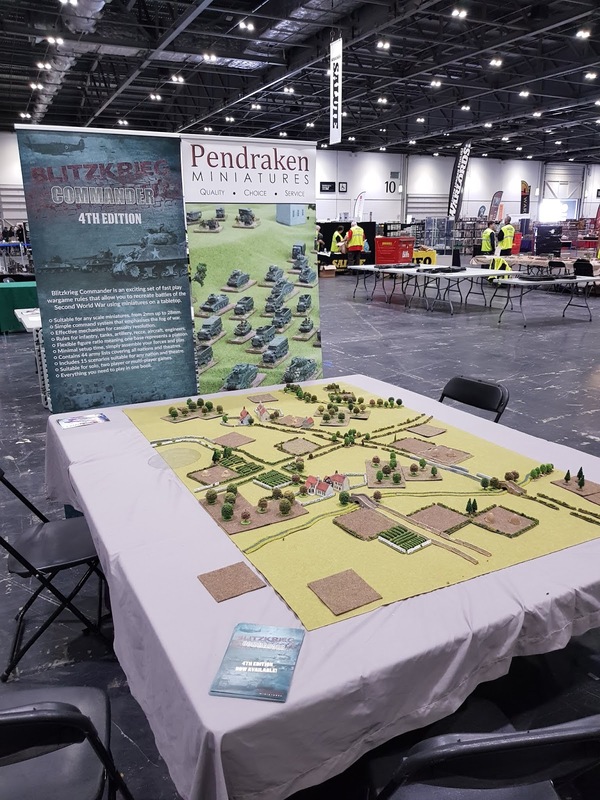 Thanks to Pendraken for organising the table and providing the forces and to Richard P, Mark J and Andy T for such a fun days gaming. 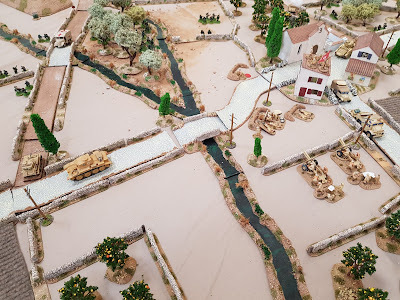 Thanks to Richard P for driving me down - sadly, no thanks to Cheshire West road repairs or Google Maps for closing the A51-A49 junction overnight with no updates on the mobile phone, which provided me with a 20+ mile detour at 10pm last night. It was, despite that, great to see so many people and catch up - now where to start with all the new figures and reading material. As ever, thanks for looking.